Before you come down to a decision if a VPS is a right choice for you (Hint: it probably is! ), let’s decipher what exactly a VPS is and how does it help. Then, you can start making the pertinent questions to decide if you should go for one or not. All right, so you are probably thinking or trying to decide between a virtual private server, a dedicated server hosting, or shared hosting. Really quick we will mention that a dedicated server hosting might wind up bringing you more problems than it solves. But then, again, it is your call. These are some of the benefits of a VPS hosting. A virtual private server works pretty much like your own server. This includes being able to make any kind of changes that you want. In doing this, you will not be affecting other websites hosted on the same virtual server. You also do not need to worry about hardware and operating system requirements as you host provider takes care of that for you. So, the benefit here is flexibility. As said before, your activity will not affect any other website. If either you or they have issues with their bandwidth, disk space, and others, this will not affect third parties. This makes your website safer and with a higher guarantee that it will keep running uninterrupted. A VPS provides full control and the highest security without breaking the bank. You only need to worry about your business. You do not need to worry about expensive hardware management or complicated administrative server tasks. Even when you are sharing the server with other users, there is no risk of security breach. The unauthorized access to your server is restricted to you and those you allow. Very importantly, if you envision more traffic and business growth, you should be able to scale up without causing any glitch on your website. A VPS is capable of providing this space to scale up or down, depending on your website needs. Do I need to have maximum security on my website to ensure that I will not get hacked or have some information breach? If that were to happen, do I have what it takes to contain the damage? Is the information I will be sharing with members of my organization sensitive enough for it to need safe encryption? Would it be ok if my website suffers some issues because another user of the same dedicated host was fooling around and made the entire server crash? Again, am I willing to contain the financial damage that a fallen website will cause me? Do I have a vision of more traffic in the future and will need to scale up easily in the future without causing any glitch on my website? Using a virtual private server involves an investment, one that we are sure will pay off on your perfectly safe website hosted by reliable servers. So you have your first 3D printing project in mind. Kudos! We can think of that as a first step towards success. But nothing gets done until it is done. You are probably there sitting with nothing in your hands. But do not fear. All you need at this point is some willpower and determination. You will need those especially to collect the money you will be needing for your project. Check out this simple tutorial on how to get started on your first 3D printing project. A 3D printing software. This is where you will be designing your already conceived design. Of course, if you want to skip this part, you can simply download already designed blueprints from the internet. But since you have probably decided to create your own model, you should use a CAD software to help you with that. The learning curve for this software can get a little steep, but with practice, you shall master all the basics. You can also use a non-CAD software such as Google Sketch. However, you will need to install a plug-in to tweak and convert your final design. A 3D printer. Choosing the best 3D printer will depend on the type of project, the size, and your budget. Now, when it comes to it, you probably do not need to know about every single part of it. However, you do want to know about the basics of operation so that you can troubleshoot when the time comes (which will probably happen sooner than later). 3D printing filaments. This is what your design will be made of. There are many types of filaments. Choose one that you feel will make a good material for your design. We are talking about durability and budget. Just make sure you store your filament in air-tight containers to avoid humidity from building mold inside. Download the 3D software. You might probably want to start with a free CAD software to download. If you google this one, you will get a lot of options. You will notice that free versions offer enough capabilities and that upgraded ones allow you to tweak some more. Since this is your first project, a free software will suffice. Once again, know that after you download the software and open the grid, you will feel tempted to simply say “Do something”. Get used to the software, explore it, and got to the “How to” section every time you have a doubt. Before putting down the design on software conceive it. Sometimes, models work on paper but not necessarily in the real world. You might want to use some cheap resources to model your design and see if it can hold by itself. Decide if your design will be one printing or if it will be necessary to print two parts and assemble them together. Use your software to draw the design. It does not need to be a symmetrical design just yet. You will have time to tweak it and make it 3D-printing material. Once you are done with your design, you will most probably save it as a .stl file. Now it is time to bring the drawing to practice. Now, there are many options for 3D printing that do not involve you buying one. The cheapest printer can be found at a price of at least $600. You could find a school that offers free use of a printer or rent one at a store. Some places might even have a laser cutter that might come in handy after printing. It is time to sharpen up that design. You might need to cut out rough edges and smoothen them up. Your one finished work is a good chance for you to critique yourself. Take a look at all the imperfections and use them to improve for the future. Probably the design was too big, or you missed a little bit here or there. You will definitively have better results in the future. It is important for designers to have a good batch of online tools to help complete and deliver projects faster. We have come up with a list of 7 of the most powerful and useful tools for CSS designers. With these tools, designers can reduce the time and effort put into designing a website. Compass runs on top of Sass and makes development a lot easier. Frontend Sass developers trust Compass. It is the most powerful open-source CSS authoring framework. New developers might find some confusion about how Compass works. It runs directly through the terminal for command executing on your Sass files. If you are familiar with Sass, you should not have any problem with Compass. The great thing about Sylizr is that this CSS tool helps you easily design anything fast. Therefore, it can have some serious impact on you or your company’s workflow. Basically, your workflow becomes an easy process of clicking and coding. You can even preview changes easily before making them live. It is pretty simple yet sleek. Stylie is a very easy and fun CSS3 animation tool. You can create really complex animations using this tool. All you need to do is design the animation and grab the code. It features a tab to remove, edit, and add keyframes as well as an easy save option. Progressive Internet Explorer supports Internet Explorer 6-9. It is capable of “rendering the most useful CSS3 decoration features. It includes pretty powerful and useful features such as soft drop shadows, rounded corners, and so on. This tool allows you to quickly create snippets and place them on your website. It is pretty easy and intuitive. All you need to do is select a CSS3 element, style it, and then paste it into your project. You can easily create stunning buttons, create rounded corners, add shadow effects to any box, and several other features. As the name says, make stunning menus for your site. These menus are very intuitive and responsive. If you prefer to work with the source codes, this site has 65+ free menu designs for download. This is a CSS authoring tool that enables you to create style sheets easily. It is available for Mac and Windows. Simple CSS comes as a free tool. It is also part of a hosting package that includes hosting services such as webmail, web app installer, and a file manager. The CSS tool is pretty easy to use and can save you time in creating style sheets. The website of a business is the only way clients have a direct view of what the company is about. Therefore, it is in the best interest of a corporation to make it look stunning. If a business or corporation also has a physical store, then we say they have 2 “exposure sources”. The same dedication that is given to designing and decorating a physical store should be given to a corporate website. But what makes a good web design for a business site? Certainly, it is more than only the design. Truth being said, establishing a standard of what works is nearly impossible. There are certain considerations that can be taken into account when designing a corporate website. It will depend on the characteristics of the corporation and even on their mission and vision. The perfect template for a business website has a design that is both modern and appropriate for the type of business. When it comes to a code, this has to be clean. First, this code comes from a reliable template resource. Make sure you can test the reliability of a template company. There are many out there live today and gone tomorrow. A good code resource has availability of updates and support. Ideally, this support should be 24/7. A nice and neat-looking website has a great impact on branding, which basically is the main goal of a business website. A website should be highly responsive and intuitive. It attracts and holds customers. It helps create and establish business connections. A greatly designed website will not fail to attract new customers and a wider audience. The company’s website may become the reason why a visitor decides to purchase a service or not. A great design makes a business or project look memorable and captivating, which will make visitors want to know you more. When a website has a flawless responsive design, it gets more visits and better ranked by Google search. Remember that a good web design is not based on the design alone. Innovative design and constant updates, to keep clients up to date. An expandable portfolio to showcase past work with other clients. So, you are ready to start setting up your website from scratch. You have certain requirements of content layout and functionality. A wireframe is what you have before visual effects and content are added. Let´s take a look at the basic steps of wireframing. Get ready to get your feet wet as you go deeper into this important step in any screen designing process. The best way to think of an idea is to find inspiration. You can do this by visiting several websites and try to figure out what each designer had in mind while wireframing. But you still need to get the idea of the wireframe and see what is the content designers are giving priority to. You can do this with an app called Wirify, which allows you to watch any website in wireframe. As you go through each wireframe, try to find common places in all the designs and check out how well it has worked for them. You must then decide on the type of process you are going to implement. This process is organic, which means that designers approach the whole wireframing and translation to code or visuals differently. Decide which process brings out your strengths and makes you feel more comfortable. Perhaps you will feel comfortable with a 12-column grid and use a tool called cssgrid to get your design. 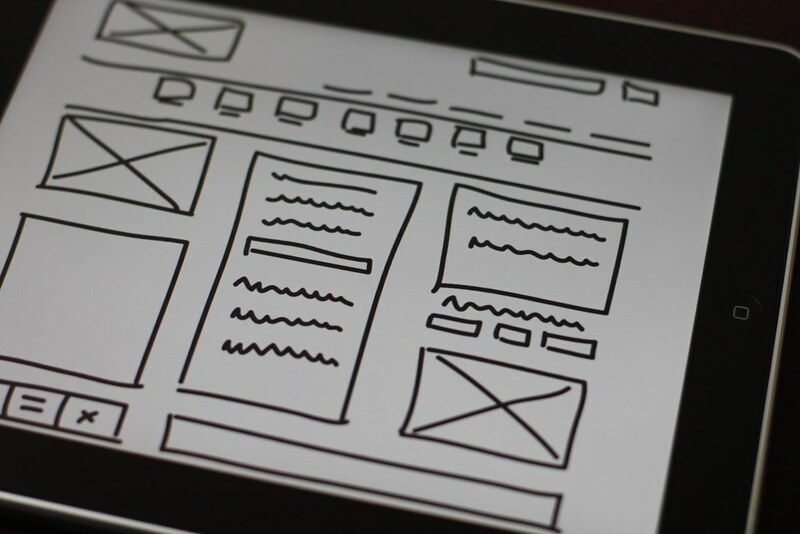 There are several wireframing tools that you can use for a faster and better wireframing. Here is a list for you to go and check out. Remember, do what works best with what you are. There are much more in town but these are the most widely-used products. Once you have set your mind in a tool and already have it running, it is time for the grid and then the layout. For starters, you should set a document size. A proper size is 1280 x 900, especially if the picture will need some color enhancement. Next, you will import your template from cssgrid to your document. When it comes to layout, you should think of boxes. Think of what is the most important things on the website and which will be the easiest and most comfortable position for your template. You can start adding information little by little. This will help you decide what design has a better flow for informing. Also, think of your client’s requirements and actual needs. Use Grayscale to determine the visual strength of your elements. The advantage of it is that it will later help you in the design process. Your business, blog or ecommerce store needs an appealing and high converting web design. Don’t get caught up in what looks pretty but remember what your website is actually for and that is to bring you customers. Without it doing that for you all you have is an expensive piece of real estate on the internet that isn’t serving its purpose. How do you make your website work for you? You can use theses 5 simple tips to improve conversions. Not long ago, many websites had Flash animations and intros, today that is kryptonite for your website. You want simple clean designs, visitors don’t appreciate noise. Turn off videos and audio files that auto play and give them solid content that they can easily digest. It’s 2017 and not only does your website have to be mobile but now you need to go one better. Each year more and more traffic comes from mobile devices so creating a site strictly for desktop is shooting yourself in the foot. You need a site that works on every device and make sure that all the features of your site stay intact. Now even mobile has evolved with Google AMP. Stock photos are used on every other website that is exactly like yours, and you need to stand out. The can work just fine on a blog post for example but when it comes to your “About” page then get some professional headshots done. Real photos increase confidence in your brand and the services that you offer. Here is why you need to stop using stock photos. Remember the “three click rule” where it shouldn’t take your visitor more than 3 clicks to find anything that they are looking for, and all of that should take less than three seconds. Make your navigation menu as easy as possible to find things. Too many choices are overwhelming and your content gets lost. Clear calls to action take your visitor exactly where you want them to go, be it filling out a form, calling your business or making a purchase. Your website is there to be a tool for your business so you need it to be a tool that works. Optimizing for conversions ensures that you can turn the visitors that come to your site into customers. It’s important that you lead your visitors where you want them to go. Websites in today’s world need to be developed and functional. We are probably aware of the fact that successful businesses are backed up by great websites. A unique and functional website depicts what your business values are and hence sales are boosted as compared to a bad website that ruins your business sales especially. Content of any website is the determiner of how informative a website is. Customers, who are the main promoters of any business, need to have awareness of the various services offered. This is the main purpose of a website; hence a well informative article serves this purpose of relaying crucial information to them for any clarification. All the information about services and products offered by your business should be included in the website. Ensure to keep your website flowing. As we already know, complexity creates confusion. Therefore, the more complex your website is, the more confusion your customers or clients experience. Simple websites actually capture the attention of many users hence you business progresses due to increased number of customers. This is the secret behind many successful businesses. Usually, the font size and type used on your website determines the number of users that access it. It is advisable to use the right font that can be read without any difficulty. The general appearance of anything can determine its composition. In the same way, how you choose colors of your website determines a lot in your business. Overusing colors ruins the appearance of your website too. Therefore, you should be careful on how you choose the colors to distinguish different features in your website and this depicts a great picture to the users. 5. Do not include irrelevant content in your website as this puts off users from you website. 6. You focus should revolve around the users’ needs. It should be spontaneous to pull in more users in order to enhance business promotion. 7. Search for unique features to boost your website and in order to separate you from your competitors. In today’s world, with the rapid developments that we experience, website design too needs to develop in order to promote businesses.